Serving Atlanta and the surrounding Metro Area. Mowing and fertilizing are considered basic maintenance practices, and each has a significant impact on the quality of a lawn. These routine maintenance practices are normally done when it is convenient for the homeowner; however, they should be done on a schedule and at the proper time in order for them to be most effective. We sharpen the blades on our machines on a regular basis so that our clients' lawns receive the absolute cleanest cut possible. Dull mower blades will not only make your grass appear jagged and uneven, they will also make your lawn more susceptible to disease. 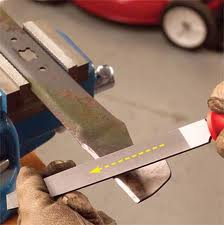 By sharpening our mower blades daily we help prevent such things from happening. Mowing is probably the most important maintenance practice for a good-quality lawn but is probably the most overlooked maintenance practice as well. Fertilizer, pesticides, turfgrass seed, and other treatments will accomplish very little if lawns are not mowed at a height that is healthy for the turfgrass plant. This maintenance chore is often taken for granted unless you realize that mowing directly affects the health and quality of a lawn and that it has a measurable effect on the way a turfgrass plant grows. The ability of a grass plant to sustain itself after frequent close mowing is one factor that distinguishes a specific grass species as a turfgrass versus just a grass. Grass plants such as corn or wheat cannot tolerate frequent close mowing. 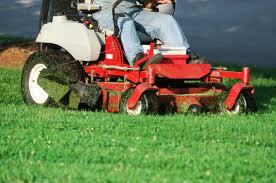 Mowing is the process that creates a lawn rather than a pasture or a meadow. Proper mowing is important in creating a good-quality lawn because it encourages a dense stand of turfgrass plants, which keeps out weeds through competition for nutrients and sunlight. In addition, frequent mowing provides control of many weeds, especially broadleaf weeds. Some important factors to consider are mowing height, mowing frequency, and the type of mower used. For the best appearance and quality, turfgrasses should be mowed at the optimum mowing height for the proper growth and health of the specific turfgrass species that is present in the lawn. Each turfgrass species has a range of mowing heights that are preferred for its optimum performance. Turfgrass species that spread or grow horizontally, such as bermudagrass, can usually be mowed at a lower mowing height than an upright-growing "bunch-type" turfgrass like tall fescue. Turfgrasses with smaller leaves (fine textured) such as zoysiagrass can usually be mowed lower than turfgrasses with larger leaves (coarse textured) like St. Augustinegrass. Turfgrasses that are under environmental stress such as drought, heat, or shade should be mowed at a higher mowing height. Table 1 outlines the suggested mowing heights for the turfgrass species used for home lawns in Georgia. How often should a lawn be mowed? Mowing frequency should depend on the growth rate of the turfgrass plants, but it is often based on a service contract or when a convenient opportunity presents itself. The rate of turfgrass growth depends on the type of turfgrass (turfgrass species) present in the lawn, soil fertility (especially nitrogen), and weather or environmental conditions. Another factor involved with mowing frequency is mowing height (see Table 1). A good rule of thumb is to mow your lawn regularly and to never remove or mow off more than one-third of the turfgrass height at any one mowing. For example, if you are maintaining your lawn at a mowing height of 2 inches, you should mow the lawn when or before the turfgrass reaches 3 inches in height. Also, by following this "one-third" rule of thumb, you will have fewer and smaller turfgrass clippings to deal with. If the turfgrass becomes too tall between mowings, raise the mowing height and then gradually reduce it until the recommended height is reached. 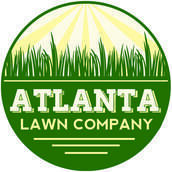 For many years, there has been a lot of discussion about what to do with turfgrass clippings. 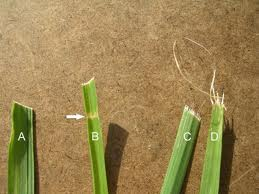 The classic response was that turfgrass clippings must be removed from the lawn because they can cause thatch buildup. Recent research has shown that this is wrong. In fact, turfgrass clippings contain approximately 58 percent of the nitrogen that we apply to our lawns, so removing the clippings is equivalent to "sweeping up" almost one-half of the nitrogen fertilizer you have applied. In addition to containing about 4 percent nitrogen, turfgrass clippings contain 1/2 to 1 percent phosphorus, 2 to 3 percent potassium, and smaller amounts of other essential plant nutrients. Therefore, turfgrass clippings should be returned or recycled to the lawn because these nutrients will eventually return to the soil. 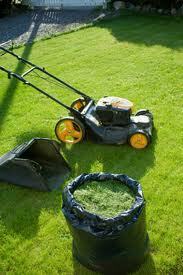 Turfgrass clippings should be removed, however, if they form clumps on the lawn surface after mowing. These clumps of clippings can block necessary sunlight from the turfgrass plants. Clumping occurs with infrequent or inconsistent mowing and when turfgrass plants are mowed when wet. Understanding the nutritional requirements of your lawn and the "baseline" soil nutrient levels are important steps toward producing a quality lawn. Fertilization of lawns is essential for the production of a quality turfgrass stand; however, applying more than the recommended amount of fertilizer or applying it at the wrong time can create problems, such as groundwater contamination. A well-planned and environmentally sound fertilization program takes into account several factors, including the native soil fertility levels, fertility requirements of the specific turfgrass species, desired turfgrass quality, source of nutrients in the fertilizer, fertilizer application rate, fertilizer application frequency, and time of fertilizer application. All plants require certain nutrients or elements for proper growth and appearance. There are 16 known essential elements that are required by turfgrasses for their growth. All of these essential elements, with the exception of carbon, hydrogen, and oxygen, are obtained from the soil and absorbed by turfgrass plant roots. Insufficient nutrients in the soil may limit turfgrass growth and the quality of the lawn; however, these essential elements can be added to the soil through fertilizer applications. Elements that turfgrasses require in the greatest quantities are nitrogen, phosphorus, and potassium. Nitrogen is probably the most important element you can apply to a lawn. Nitrogen affects turfgrasses in several ways, including color, density, leaf growth, root growth, tolerance to environmental stresses, susceptibility to pests, and recuperative potential of the turfgrass after it has been damaged. The proper nitrogen fertility program should allow for a slow, steady growth rate of the turfgrass. Applying excessive amounts of nitrogen fertilizer will encourage leaf growth at the expense of root growth and may even cause a reduction in root mass. Fertilizing with high levels of nitrogen will also increase the incidence of diseases and thatch accumulation and reduce cold tolerance, making the lawn more prone to winter damage. Several factors influence the nitrogen requirement of your lawn, including the turfgrass species that is present in the lawn, the soil type, and the environmental conditions of the area. 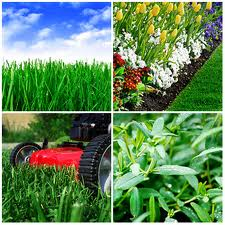 The timing of lawn fertilization is also important. Fertilizing warm-season turfgrasses too early in the spring can cause a reduction in root mass as the turfgrass plants emerge out of winter dormancy, and fertilizing them too late in the fall may increase the chance of winter injury. Cool-season turfgrasses should be fertilized during the early spring and fall because fertilizing them with nitrogen during the summer increases the chances of disease and/or heat-stress problems. Phosphorus is also needed for turfgrass growth and is involved in energy transformation within the turfgrass plants. It is generally required in smaller amounts than nitrogen or potassium and plays a critical role in the establishment of turfgrasses. On soils that are low in phosphorus, an application of this element will increase the growth rate during establishment of turfgrasses. However, high levels of phosphorus can cause problems, especially with centipedegrass. Potassium is almost as important an element as nitrogen to turfgrass growth. Potassium affects how well a turfgrass plant is able to withstand environmental and mechanical stresses. Most turfgrasses will better tolerate cold, drought, and heat stresses when potassium levels are adequate.